The path was a right state before we got our hands on it. Helping in the community. For those that don’t know, we’ve recently moved into Pennsylvania, one of the most hilly parts in Exeter and also probably the most quiet there is. Running behind our house is a stream and a small wood that’s roughly 40 foot wide, and hundreds of yards long. Between that and the estate beyond is a path. 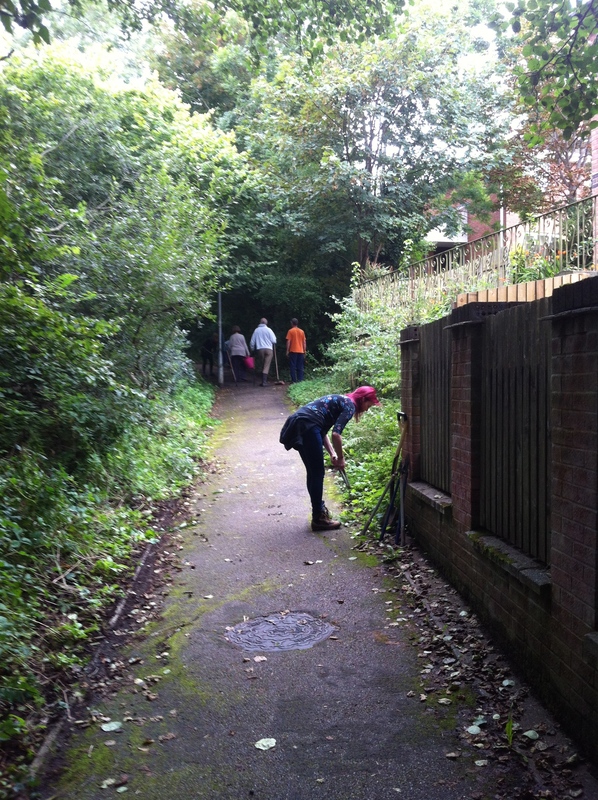 And it’s this path that we were helping to clean up. The reasons for this are that “On 12th October 1989 the developers of the Sylvania estate in Exeter (Costain Homes) transferred ownership and maintenance responsibility of the open land on some areas of the estate to the Public Open Spaces Charitable Trust. The object of the Trust is “to hold the (land) as a public open space to the intent that the (land) may at all times hereafter be available to and be used by the public at large for the purpose of recreation”. Although the Trust continues to pay for essential health and safety work, it now has insufficient funds to undertake routine maintenance on the open land on the estate. And so the project was founded, working on the area every three months or so. The day was very hot indeed, and there were roughly ten of us working along a stretch of about two hundred yards or so. Karen and I thoroughly enjoyed ourselves, although it did hammer home the fact that we need to do something about our garden. But that just seems like too much work. This was fun. We were helping the community and getting to meet a number of people from our road and Linnet Close. Many people went past as we were working, all saying good morning, and some thanking us. One chap actually asked what we were doing and then offered the services of his petrol-powered strimmer. Once he got going, the difference he made before it upped and died was amazing, widening the path beyond the tarmac’d lane and making it much brighter. All in all, it was great fun, a great way to meet others in the area, and fabulous to see the difference our efforts made. Now, if only the trees could stop dropping leaves. That would be marvellous. If you live in the area, or want to volunteer some time, please go to https://sites.google.com/site/sylvaniaecp/about or email sylvaniaecp@gmail.com.